So far this summer, Mother Nature has been very kind to our central-PA limestoners. 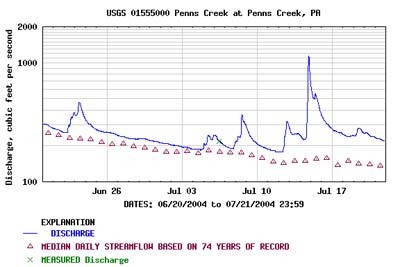 Take for instance Penns Creek, which has been above median flow for a better part of the last few months. If this continues we are looking at upwards of three years of great water on these streams. Compared to the flip-side - we'll take it!! Look for continued decent fishing as long the fish-friendly conditions persist. This will also bodes well for the fall! Perhaps our favorite time of the year on Penns. Look for the 'Hanna to continue its above-average flows. Who knows when it may come down. It is almost a certain that the northerntier is gonna get a decent dose of moisture over the next week or so. 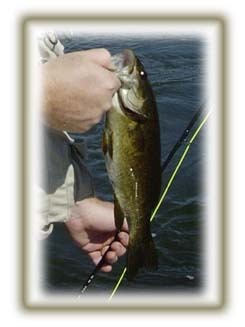 So keep an eye on those flows...currently they are a little high for effective an effective smallie outting. Just a heads up that web updates are gonna take a short break over the next week to 10 days as traveling will not permit any pc time. Look for Reports to kick back up again once we get into August and the second half of the season. Nathan and Tim are two very accomplished fly fishermen and wanted to give the Lehigh a try in July. Last week when I talked to Nathan I told him not to get his hopes up since the river was experiencing very low water flows and high water temps for the past two weeks. I almost told Nathan that we should reschedule his trip for the fall. Well, we got some much-needed rain earlier this week and the daytime air temps were relatively cool combined with some water-cooling overnight lows. Well, the rain brought up the river flows up to floatable conditions and the water temps dropped considerably (68 degrees at 6pm) due to the cool evenings and a healthy dose of cold water (~55 degrees) being discharged from the Beltzville Reservoir on the Pohopoco Creek. We started out the evening with a good old fashion 20 min soaker and some of mother natures fire works. The skies cleared and we set off down river from the Gap. We hit the first riff and Tim hooked up with a couple of 10" smallmouth bass on a bugger/wet fly combo. As we continued a few olives, cahills, isonychias and sulphurs started popping on the surface. Not a large quantity of one specific species, but enough to bring a few fish to the surface. We saw a nice fish rising in the pool below the first riff and Nate made a nice cast with an Iso dun. First cast over the fish and BAMN!!! Fish on! The fish was a nice 14-15" brown that pulled the hook after a 5 minute battle just prior to bringing him to net. We made are way down river and began to see more fish rise. Nate hit another brown about 12" and then Tim started to get into the act and hit a few fish. Most of these fish were in the 10-12 inch range. It was starting to get dark and we continued on our way down thru the last big riff. We actually saw a few fish rising in the pocket water. At the end of the riff, I saw a nice fish rising in an eddy created by one of the many large rocks in the river. Tim and Nate made some nice casts but we couldn't get the fish up. Tim finally made a good cast/drift and right when he was ready to pick up the fly...BAMN!! the fish smacks his fly. 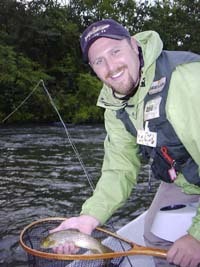 After a 5 min or so battle a 14-15" brown comes to net. This fish was extremely FAT and healthy. We made our way down thru the flat pool and saw only one pod of rising fish but light was getting low and after a few attempts we decided to head to the take out. Great job by two very good fly fishermen. Tim was TOPROD for the night but Nathan was not far behind. Don't think it gets much better in Mid-July on the Lehigh. Just wish we had these water temps all summer long??? FYI - the discharge from FEW was 70 degrees today....amazing how the water actually cools as it gets farther from the lake. What's wrong with this picture? HUMMM??? Tim is pictured above with a really nice looking Lehigh River brown. Nate is all smiles after bringin this one to net! The CDC Sparkle Dun has been added to the Patterns Page. This one imitates an Olive, but just about any mayfly can be effectively copied by this simple pattern. Make sure you have a few of these in the box. Well, we did need the rain, but not the 1,000 year flood NOAA is calling it over in Jersey. What this did do was provide a vital shot of recharge water for the watesheds that did not get the deluge. And it looks like more might be on the way...hopefully not too much though for the flood prone locations. But you gotta take what you can get this time of year in our minds. An afternoon on the Po was the order of the day for Karl and Bob. Lots of laughs and some all right mid-summer trout action made it that much more enjoyable. Karl thinks that was due to operator error?! 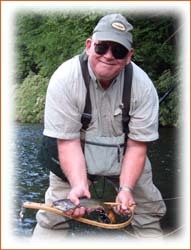 Bob hoisting a nice size PA brookie. Dean had out father son duo Dan and Colin for another adventure in fly-fishing. Dan said he wanted to try for some smallies on the fly. So we hit up the Susquehanna for a try at catching a few smallmouth with the fly rod. Overall fishing was still slow. The bite was a bit off and the fish must still be in their post spawn funk. Two fish were brought to the boat with a few more LDRs. Did manage to hook a fish on a popper during that afternoon which is a good sign the fish might be coming around. More damsel flies buzzing around and a few bass literally leaving the water to grab one of those insects. Today was more of a learning experience and to gain some insight in bass fishing in general. 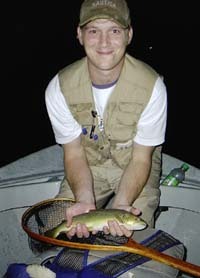 Neither ever experienced the Susquehanna and the size and beauty that come with fishing the river. Great job by both anglers today. The word is that the off-bite on the 'Hanna is from a late spawn. Once the spawn occures there is about a month of soft bite and I guess we are still in that time frame...usually June is the month when we have this downtime. Not this year....I guess patience is the name of the game right now. The trikes are on the Lehigh Valley streams and most likely the Tully as well, but with this heat look for the bug life to be an early am affair. First light is the name of the game. Of course there are the mountain brookie streams. These can be so much fun to fish, especially a mountain tumbler you've been on. What can be better than water temps in the fifties, dry fly action and PA's state fish! Enjoy the weekend. Got questions - shoot us an e.
On Saturday we were able to finally do a float on the Susquehanna. Water temp in the am hours was 79 and there was some weed floating here and there. Overall the conditions were perfect, but the bite was only so so. All said we took about dozen fish - with some going about 14". Everything was down deep - with a heavily weighted madtom imitation being the best producer. From here on out look for the action to only get better. The only negative is that perfect conditions on the 'hanna means we are in need of some rain!! 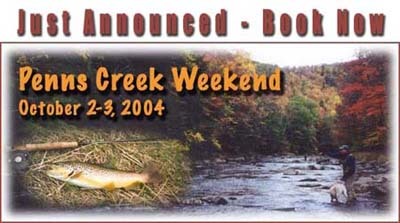 Having said that the central PA limestoners are still fishing well. There has been a smorgassboard of bugs on Penns - sulphurs, cahills, olives and isonychias. Look for continued updates as we have a few outings planned this week. On Tuesday Dean was able to wade fish the river abit before attending the LRSA meeting. He reports he started at the boat launch and worked his way down through the fast run. After trying a dry/dropper rig with little results, he switched over to a bugger and wet fly combo and began to swing that set-up. That was the ticket. By the end of the evening three spunky trout (2 bows and 1 brown) and seven smallies in the 10-12inch range were landed. Plus a few LDRs. He left prior to dark with the water temp pushing 71 degrees F. There was one other fisherman on the water and there were a few BWOs (#18) hatching, but not much else. I guess it might be time to give the trout a rest and change gears to smallmouth fishing on the Susquehanna. If you go to the Lehigh, bring a thermometer and check the temp before you fish. Hopefully we get a little rain soon to bring flows up a bit and cool down the river for the trout. With that said, the smallies are really smacking the flies right now. This is definitely something worth trying on the fly.